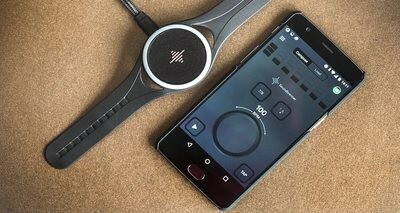 The Soundbrenner Pulse is an app controlled metronome you wear like a watch, sending vibrations to your wrist as a way for you to reference time. The Soundbrenner Pulse is an app-controlled metronome you wear like a watch. DJs can use this to stay in time when practising tricks like cue point juggling and finger drumming, or even for practising scratching, which adds a different "physical" feel to the tempo. Wait a tick... what's a metronome? A traditional metronome is a device you set on top of a desk that makes consistent click sounds based on a tempo or BPM. Traditionally, musicians use this when they practise with their instruments so that they can work on staying "in time". The Soundbrenner Pulse is also a metronome, but it innovates by working silently, instead sending vibrations to your wrist that are in time to the tempo that you've set. You set the tempo by tapping your fingers on the Pulse or turning the wheel to increase or decrease the BPM, or by using the accompanying smartphone app. By using the app, you can also sync up to five Soundbrenner Pulses to one smartphone, which then sends the tempo to all connected devices. This is great for keeping everybody in time, for example if you're DJing and you have live musicians onstage with you or at a jam session. You can also send your digital audio workstation's (DAW) metronome to the Soundbrenner Pulse, so you feel the tempo instead of hearing the clicks, which is good news for DJ/producers who record vocals in their bedroom since that means that those clicks won't bleed into their recordings. It looks like a cool innovation for a tool that's been around for a long time (the first patented metronome was in the 19th century) and for DJ/producers, it's a nice alternative to the traditional metronome when recording at home. Check out our short talkthrough below. • The Soundbrenner Pulse is now available for US$99. Check it out at the Soundbrenner website. What do you think of this metronome? How would you incorporate it into your live performances? Have you ever DJed with a live musician? Let us know in the comments below.